At the point in my timeline below, the playback drops to less than 1FPS, whereas just before that point it’s smooth playback. It’s a 30FPS vidoe, but I don’t know for sure if that’s reached, but it is smoother and the audio is fine. 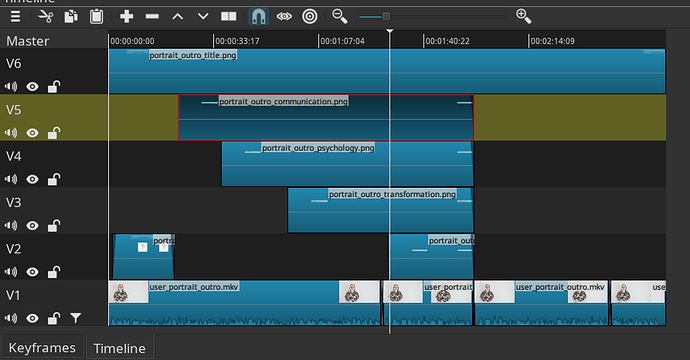 At this point in playback it becomes too slow to be usable and the audio is fragmented. The bottom track is a video and the others are all still images. Each has a slide-in and fade out effect on them. Marking them as hidden makes no difference in the playback speed. Removing the bottom image lets it play normally again. Are you talking about the preview window in Shotcut, or the exported video in another player like VLC? If you’re speaking of the preview player, depending upon filters, and your computer’s specifications & software envrionment, this may be normal. Editing from a HDD vs SSD/NVMe will make a huge difference. Noticed you have a track filter applied to V1. Since you’re having issues with the bottom image, perhaps it could be the track filter. This is the preview window. I understand that if I try to do too much it will stutter, but in this case it’s drastic difference with the addition of a single static image. I use filters on the movie in all my projects, and only with this extra static image does a problem appear. Looking at the CPU use, either Shotcut isn’t taxing my system fully during preview, or it limits the number of cores it users. I have 8-cores, 16-hyperthreaded. I’m using a recent SSD, and have 32G ram. There is not enough information to reproduce this and address it. A single static image on the bottom of a complex multi-track project is not enough. I doubt there is anything I will do about it anyways given the priorities of other bugs and features. Yes, sometimes you can push the engine into a miserably performing state, and there is not enough optimization in general.